Where is the meat you’re buying really from? Many of us look for the “Product of USA” sticker on the meat we buy in the supermarket, but we may not be aware that the USDA allows meat raised outside the US to carry that label. It’s a shameful case of government-sanctioned fraud. 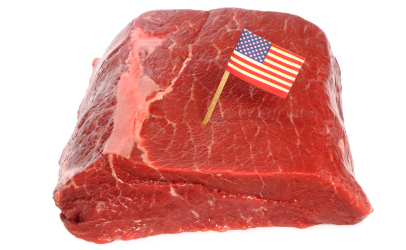 Current USDA policy allows foreign meat to be imported to the US and carry the “Product of USA” label if it passes through a USDA-inspected plant. The USDA loophole allows foreign multinational corporations to disguise their products and take advantage of the lucrative US market. There’s good reason to believe that this loophole also violates the federal government’s own policies that prohibit false or misleading labeling. Thank you, thank you for all the wonderful info you put out! We need more people and institutions like you, speaking the truth! In regards to your USDA foreign meat article, unfortunately, many times emails and ‘public comment periods’ are simply meaningless tactics the fraternity-like establishment uses to appear like they care, but in fact, are simply fake and only used as a veneer to appease public ire. If the decision-makers in the USDA are corrupt, they will never truly change even if the people speak out. They may kind of scurry for cover, like cockroaches do when you turn on the light, but that’s it. Instead the American public needs to be aware of who the corrupt officials are, and work to have them replaced with, hopefully, good, conscientious leaders who have a proven track record of making good, ethical choices favoring the American people. This, of course, takes more effort than firing off an email, so we need encouragement from our pastors and other religious and civic leaders - and reputable media agencies like yourself! - to follow God’s command to engage in good works that stand against evil and also bring honor to His name. Sadly, this kind of encouragement is lacking in the church, probably from fear of engaging in ‘political issues’ and losing either congregants or their 501c3 status. Thanks again, Health Impact News. Keep up the good work!